The accuracy of DE-MRI measurement of myocardial infarct size in the acute phase has previously been investigated in different animal models. However, there is still an ongoing debate whether edematous reversible myocardial injury in the peri-infarction zone hyperenhances or not. If present, hyperenhancement of reversibly damaged myocardium will either lead to overestimation of the infarct size or indicate salvageable myocardium. The ability of DE-MRI to quantify myocardial infarct size has often been based on a slice to slice comparison between DE-MRI and corresponding TTC. We wanted to evaluate the ability of ex vivo DE-MRI to depict and quantify acute myocardial necrosis on a global level using TTC as reference method in a closed chest pig model. In 12 domestic pigs (40–50 kg), the left anterior descendant artery (LAD) was occluded immediately distal to the first diagonal branch for 40 min, through inflation of an angioplasty balloon. Before explantation, the heart was reperfused for 4 h 22 min ± 47 min. Ex vivo DE-MRI was performed using a 1.5 T Philips Intera CV MR scanner. A gadolinium-based contrast agent (Gd-DTPA) was administered intravenously (0.2 mmol/kg) both 60 and 15 minutes prior to removal of the heart. After removal, the heart was immediately rinsed in ice cold saline and the ventricles were filled with balloons containing deuterated water. Three-dimensional images with an isometric resolution of 0.5 mm covering the entire heart were acquired using T1-weighted sequence (Fig 1). Subsequently, the hearts were sectioned into 4 mm consecutive slices in the short axis view, stained with TTC and scanned digitally (Fig 2). The short-axis ex vivo DE-MRI images were analyzed by manual delineation of the myocardium using freely available software (Segment 1.673, http://segment.heiberg.se). The infarct volume was calculated as the product of the slice thickness (cm) and the area of hyperenhanced pixels (cm2). Hyperenhancement was defined as 8 SD above mean intensity of non-ischemic remote myocardium. The number of standard deviations was identified by using the k-means algorithm which agreed well with visual inspection. 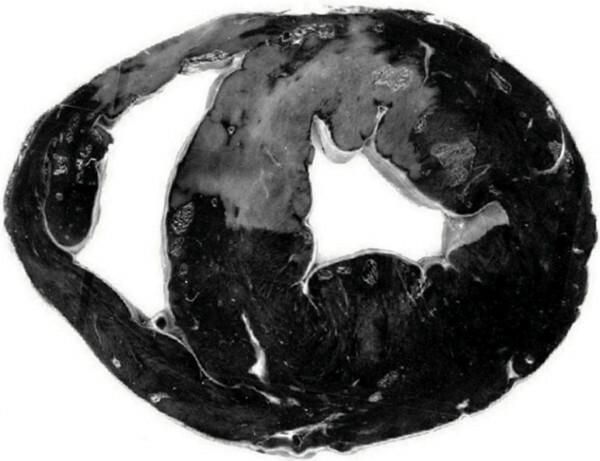 In the TTC stained slices, infarct size was determined by manual delineation of the endocardium, epicardium and TTC-negative area of the scanned images by an observer blinded to the ex vivo DE-MRI findings. Same software as described above was used for this purpose. Finally, the global amount of hyperenhancement assessed by DE-MRI and infarct size by TTC were calculated and expressed as percentage of left ventricular mass (LVM). A representative mid-ventricular ex vivo DE-MRI slice. Corresponding TTC staining to the DE-MRI slice shown in Figure 1. There was a strong correlation between the global amount of hyperenhancement assessed by ex vivo DE-MRI and global infarct size determined by TTC histochemistry (y = 1.27x, R2 = 0.93, p < 0.001) (Fig 3). The hyperenhanced region measured 29 ± 8% and the infarct size by TTC was 23 ± 6% (mean difference, 6 ± 2%). Thus, the amount of hyperenhancement myocardium was 27% larger than the infarct size determined by TTC. Results are presented as mean percentage of LVM ± SD. 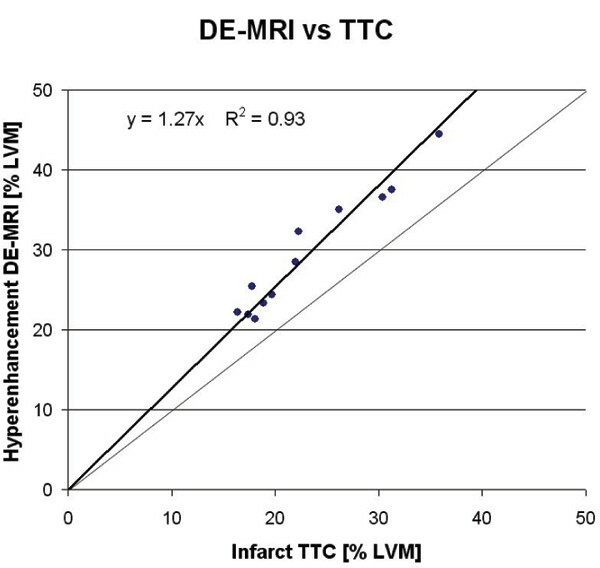 Statistical relationship between the amount of hyperenhancement by DE-MRI and infarct size by TTC. (LVM = left ventricular mass). The global amount of hyperenhancement assessed by ex vivo DE-MRI is 27% larger than infarct size determined by TTC histochemistry in the acute phase. 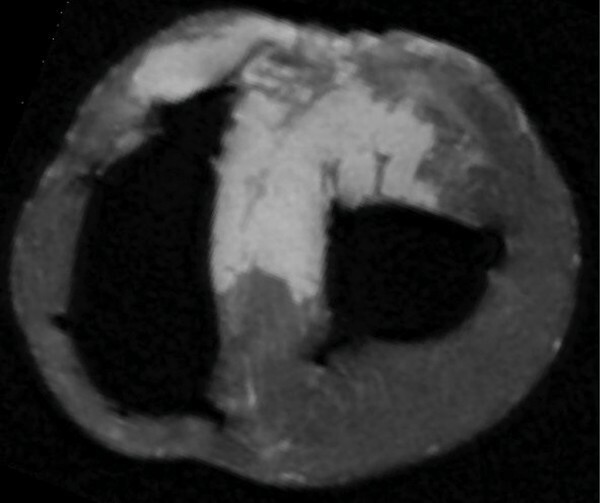 This may be attributed to hyperenhancement of both necrotic myocardium in the core of injury and injured but viable edematous myocardium in the peri-infarction zone. Thus, using hyperenhancement in DE-MRI as a definition of myocardial infarction will result in overestimation of myocardial infarct size in the acute phase of reperfused ischemic injury.